Reservations, a mystery/thriller, is set near Gallup, New Mexico where the Navajo, Hopi and Zuni reservations are adjacent. Three tribal leaders have been murdered - murdered in a fashion that suggests the deeds were carried out by the COYOTE, a legendary evil trickster feared by many Native Americans. The tribal president contacts his old friend in the FBI for assistance in solving the crimes and preventing more murders. The FBI selects its star agent, Jack Del Rio, and dispatches him to New Mexico. Del Rio finds a situation tangled in political intrigue, and must work through those issues on his way to solving the mystery. Assisting him in his quest is Officer Lucy Chee. A romantic interest develops between the two. Del Rio identifies the murderer, but not without further bloodshed and loss. When this story began I really wasn't sure if I would be able to get into it with all the initial setting being so political. Yet, after they send Jack to the reservation to get started the book was amazing!!! You need the info in the beginning to understand what's going on. 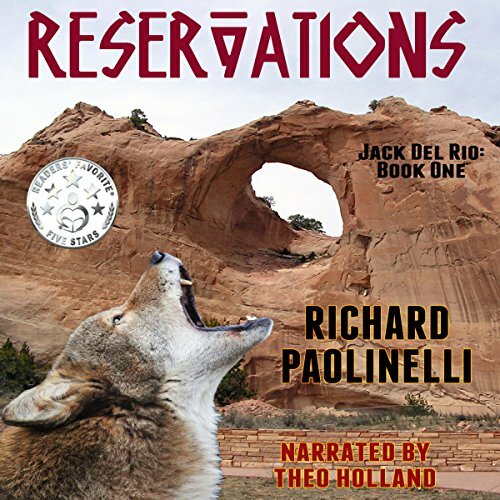 The story shows the division and friction between the different native american reservations and how Jack Del Rio works with them all to find the killer and bring safety and justice to all of them. It's a really good story with great characters and the narration done by Theo Holland takes you on a wild chase and makes you feel like you are there right along side of them watching the events unfold. I loved the Jack del Rio character and can't wait to listen to more of his adventures in the future. Exciting FBI Murder Mystery Adventure! I really enjoyed meeting Jack Del Rio. This first adventure has him trying to solve a series of murders on a Navajo reservation. The characters and plot seemed well developed and were superbly brought to life by Theo Holland. I look forward to the next installment.